One Ounce for Onion was a surprise for me. Not many talks highly about this place and it uses Thai coffee which is locally considered inferior to imported beans. However, the outcome was surprisingly decent to the point that I can suggest people to drop by here for espresso based coffee. 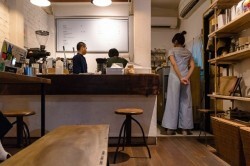 One Ounce for Onion (OOFO) is mentioned in 7 Good Cafes In Sukhumvit, Bangkok: The Sprudge Coffee Guide, an article on the coffee news website Sprudge, for quite some time. However, bear in mind the writer was writing with suggestions by the staff at Roots, another café in the area, at the time. Still OOFO got some cachet just to be included in the list. Whether it will perform, let try. Let talk about its location first. The shop is not easy to go as it locates deep in a small lane after quite a few turns from the main road; the way back is even more difficult, I believe, if you don’t have your own car. This is quite a norm for the Sukhumvit area, IMHO. If you decide to make a trek to OOFO, I believe the espresso based coffee there won’t disappoint you. The decoration/setting inside won’t look like pictures I post as the café underwent a redecoration after my visit. While the new design should improve your experience there, these pictures should give you a feeling of how this coffee shop feels like. 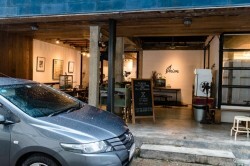 One thing that I like about this shop is that it is quite active in promoting better quality Thai coffee. I haven’t had much experience with Thai green beans. What I had so far wasn’t up to snuff vs. coffee from other established regions. So this is a good chance to try yet another coffee from Thailand. Cappuccino here has a decent milk sweetness with a hint of caramel though the caramel is sort of blur/not clear unlike coffee made from imported roasted coffee. The cup is not bad at all with nice velvety texture of its steamed milk which comes close to the superb cup I had at Bubble Café earlier on that day. Both espresso and milk drinks here use Flagbearer blend by Brave Roaster. The blend comprises Thai and Lao coffee and I somehow expect some caramel and saltiness from the component of the blend. Nevertheless, it turns out to be much better than that. 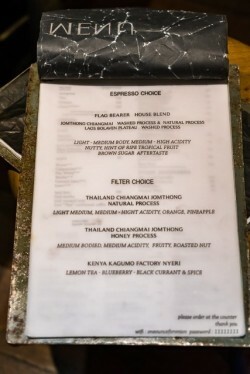 The espresso has a pleasant surprise in the form of a reasonable amount of smooth acidity in the coffee, a good thing considering my experience with Thai coffee in the past. Overall I get a balanced cup of coffee with a somewhat sweet acidity upfront, not the ‘in your face,’ which, again, is a good thing. Another good thing about this cup of coffee is that the coffee is not pulled overly tight, a break away from most coffee I had in Bangkok. It’s a much better pull so much so that I can easily sense its tasting note spreading out nicely. 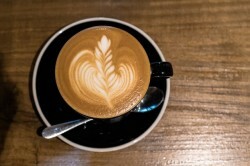 While this can readily be a non-issue elsewhere, I consider this simple issue as an achievement for this barista during this Bangkok coffee trip, particularly on the skill level and the ability of this barista on coffee tasting and in understanding about coffee used relative to his peers. In addition to barista skill, a part of good cup of coffee, to me, could be from the gears used in making coffee. The coffee gear here is rather simple with 2 group Vibiemme Replica Pistone with Eureka grinder and EK43 for drip. I’m not a fan of lever espresso machine as cups I had from lever machines in the past is an easy and simple cup with a rather round finish that seems to handle lighter roast coffee well in a sense but lost quite a few detail, particularly toward the aftertaste. 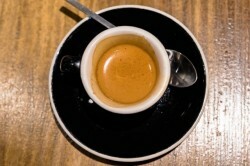 I much prefer the clarity of modern espresso machine, particularly on the clearer aftertaste. 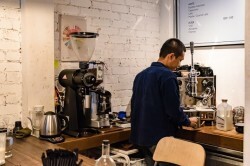 For me, this coffee character from this setup is not a deal breaker as good coffee can be had from both lever and modern espresso machine, depending on barista. 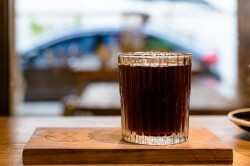 Overall, drip coffee in Bangkok is rather disappointing and this one is no exception. 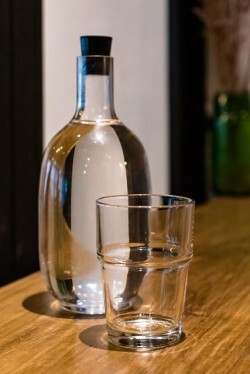 The barista suggests me a Hario V60 drip of Thailand Chiangmai Jomthong Natural Process when I ask for his recommendation. I do not get the tasting note as described in the menu. Some fruitiness can be found but it wasn’t clear what kind of fruit it is. In addition, I get some papery tone in the coffee. Nevertheless, this cup is by far much better than earlier drips I had in Bangkok up to that point. In all, OOFO is a good surprise to me considering the information I found on the internet about this café before I make this visit. Some coffee people I know of told me this is a cloth/fashion shop and why bother. Had I not been here, I would have missed one of the best coffee offerings in Bangkok at that point in time. This is one of the café I can suggest anybody to drop by for espresso based coffee. While the drip is rather disappointing, the latter conversation with the owner gives me hope that the improvement on drip is likely to come by in the future. 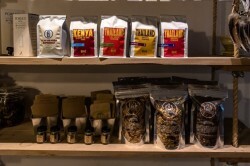 If that is the case, it will finally round out good coffee offerings at this café.